Ice Cross Downhill, an extreme sport in which speed, agility and, above all, courage are crucial. The Olympia Park in Munich will be hosting the Red Bull Crashed Ice for the third time. 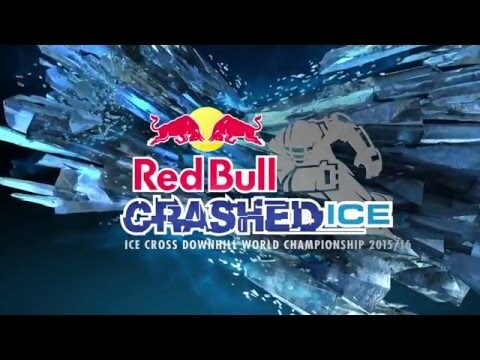 The Ice Cross Downhill World Series will be making a phenomenal comeback in 2016 with the most impressive track yet in the 16-year history of the Red Bull Crashed Ice competition: Along a length of 470 meters, a height difference of 55 meters, and technically challenging chicanes and obstacles, the athletes will reach a top speed of more than 50 km/h. Topping it all off at the end is the largest jump that has ever been built on ice. Contracted by Red Bull Germany, NUSSLI will be building the entire track from the "Olympic Mountain" to the Olympic Lake. A full 4,000 square meters of the structures will be built on water — including the finishing straight. Naturally, NUSSLI has also thought of the loyal Ice Cross Downhill fans and will be building a grandstand along the track with space for approx. 4,650 spectators. NUSSLI Erects the Most Imposing Track in the History of the Red Bull Crashed Ice in Olympiapark.